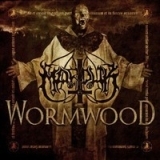 MARDUK - WORMWOOD (DIGI) | Online Shop | Wizard LTD.
"Wormwood", the eleventh album from Swedish black metallers MARDUK, will be made available in Europe on September 24, was recorded at Endarker Studios in Norrkцping, Sweden with engineer/producer Magnus Devo Andersson. The album's release will be followed by a world tour, dubbed "Funeral Nation 2009/2010", which will kick off in Europe. MARDUK was formed by guitarist Morgan Steinmeyer Hеkansson with the goal of becoming the "most blasphemous band in the world." The group's musical style started out as straight-forward, death metal-influenced black metal, but as the years went by progressed into a fast and intense form of black metal.